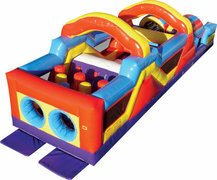 Obstacle Course Rentals from Sacramento Party Jumps are a fantastic way to your guests up out of their chairs! 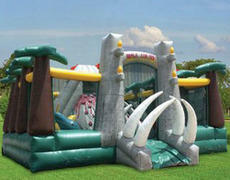 Our Jurassic Adventure Playground would be perfect for birthday parties, church or corporate events. 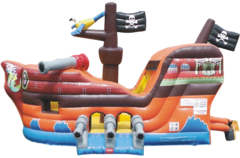 Your guests will be amazed with all it has to offer! 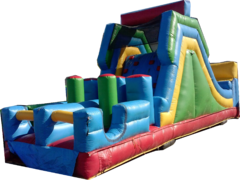 They will crawl through a bone yard and up to the top of an ancient volcano and escape the 4 rocking pop up dinos down a 10 ft slide. 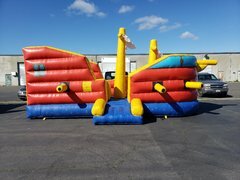 This would be a perfect addition to a themed party as well! 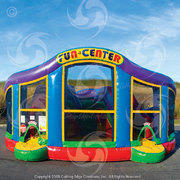 This attraction can easy entertain 10-15 kids for hours. 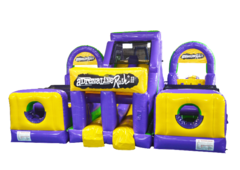 Check out Tiki Island, one of your largest obstacle course rentals. 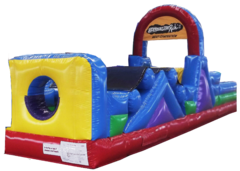 This rental boasts a large jumping area, obstacle course with pop-ups, and 2 slides. 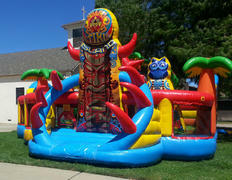 Great for a luau themed party. 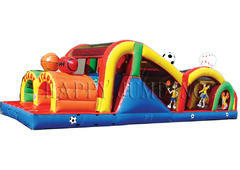 Want to add even more entertainment to the party! We have a professional magician, Mister Illusion to perform a magic show that kids and adults can enjoy. Check him out today!